88' Ferretti motor yacht | Christian & Co. The vessel was inspected while hauled. Hull construction material is molded fiberglass. Deck is constructed of molded fiberglass and above deck structures are constructed of molded fiberglass. Coring is unknown. Bulkheads are reportedly constructed of cored fiberglass. Overall condition of the hull structure appears good – excellent. The vessel’s weight is unknown. Exterior rails and hardware appear good – excellent. Cosmetic condition of vessel appears good externally and good internally. Vessel’s external colors are white. Below waterline through hull fittings appear good. The vessel is equipped with seven Rule 3700 bilge pumps and emergency engine pickups that appear good and the bilge is clean and dry. The ventilation system consists of engine room blowers and natural ventilation and appears good. General housekeeping appears good – excellent. The condition of the coring, in the stringers, deck, and elsewhere as applicable, is beyond the scope of this inspection. Engines’ external surfaces appear good – excellent and exhibit no rust, oil or coolant leaks. Engine hour meters exhibit 1160 & 1170 hours. Motor mounts appear good. Cooling systems appear good. Fuel systems and components appear good. Exhaust systems and components appear good. Electrical systems and components appear good. Engine control systems appear good and shaft log appear good. Steering control systems appear good and rudder ports were not examined (PWC on top). Propulsion components appear good. Generators’ surfaces and motor mounts appear satisfactory. Generators’ peripheral components and systems appear satisfactory. Two (2) 32 KW Kohler generators model 32EOZD, starboard serial number 2099661, port serial number 2099677. Waste systems and components appear good. General service seawater systems appear good. There is 9,000 liter capacity in one fiberglass tank located forward of engine room in bilge. Fuel tank surfaces, where visible, appear good and the securing mechanism appears excellent. The fuel fill, vent, feed and return lines and components appear good. The AC shore cords, inlets and connections appear good – excellent. The AC wiring and outlets appear good – excellent. The AC main feeds are protected with circuit breakers. Battery arrangement appears good. Batteries are equipped with disconnect switches. DC wiring appears good – excellent. Circuit protection for the AC and DC branch system appears good – excellent. Wire terminations and connections appear good – excellent. Wire organization and arrangement appears good – excellent. Vessel has fifteen portable fire extinguishers. Vessel has a CO2 fixed fire suppression system with December 2010 tag. The safety components include: fourteen PFDs and one life ring; distress flares with expired certification; suitable first aid kit; two Navy type anchors with chain and line rode that appears good. Navigational and anchor lights appear good. Other safety equipment includes: fire axe, emergency fuel shutoffs, emergency battery relays, emergency engine room escape hatch, seawater fire system with two stations, two 8-person life rafts (being sent out for service), 406 MHz EPIRB with current battery. The vessel is a fiberglass flybridge, cockpit motor yacht equipped with two diesel engines and two diesel generators. The ownership history was not obtained. The vessel was inspected while hauled. We interfaced with the captain, engineer and a crew member; however communication was limited by a language barrier. The vessel is basically structurally sound. The vessel is actively and well maintained. 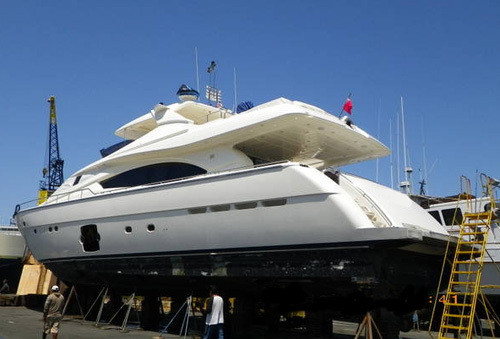 The vessel is well suited for its intended purpose as a cruising motor yacht. 2. Maintain fixed and portable fire extinguishers to the appropriate standard. 3. Repair the fiberglass damage on the port hull bottom outboard of the strut. 1. The life rafts have been removed from the vessel and are being sent out for service. Reinstall life rafts after service. 2. Two forward engine room lights were inoperative, bulbs were installed to prove the fixtures function during the survey. Provide and install functional bulbs. 3. Service as a result of surface corrosion on both generators. The starboard generator’s water pump is currently removed for service. Reinstall the water pump following service. 4. The covers are currently removed from both satellite receivers, complete any ongoing service and return the covers. 5. There is a cracked mirror in the master head, replace as appropriate. 6. The satellite telephone is reportedly not in service. 7. The anti-fouling paint is thin, the hull bottom will be repainted during this haul out.